June is a special and exciting month not only because our homeschool year is winding down and one of our daughters has a birthday this month, but on the liturgical calendar June is the month dedicated to the Sacred Heart of Jesus. There are actually 3 special feast days during June. On Sunday, June 7th, the Catholic Church will celebrate Corpus Christi ( Latin for Body of Christ), which is the liturgical solemnity celebrating the joy of the Eucharist. The history of the feast of Corpus Christi is fascinating and can be dated back to 1230 AD when St. Juliana, a Belgium nun, was led to start a celebration of the Mass. Traditionally, Corpus Christi is celebrated with a procession of the Blessed Sacrament in churches around the world. 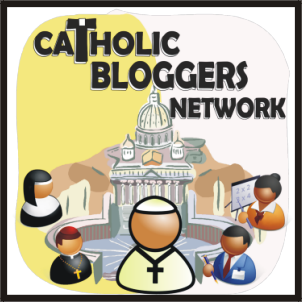 You can take a look of Pope Francis in a Corpus Christi procession. On June 12, the Church celebrates the feast of the Sacred Heart of Jesus. When our family first started homeschooling in 2005, our neighbors had a large statue of the Sacred Heart of Jesus in their backyard so we named our homeschool Sacred Heart Academy. 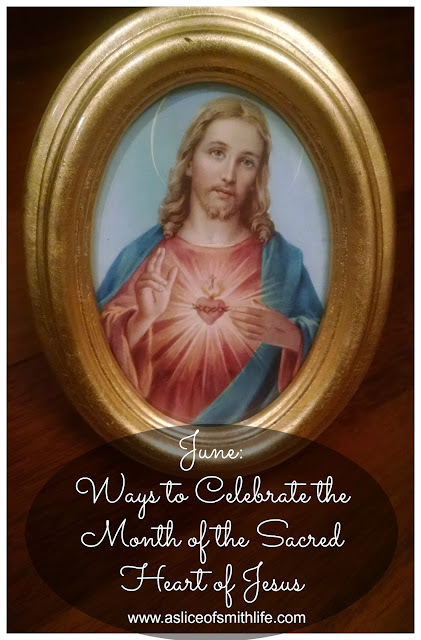 To be honest, I didn't know much about the devotion of Jesus' Sacred Heart back when I started homeschooling and to this day, I'm still learning about my Catholic faith, including beautiful devotions like the Sacred Heart of Jesus. 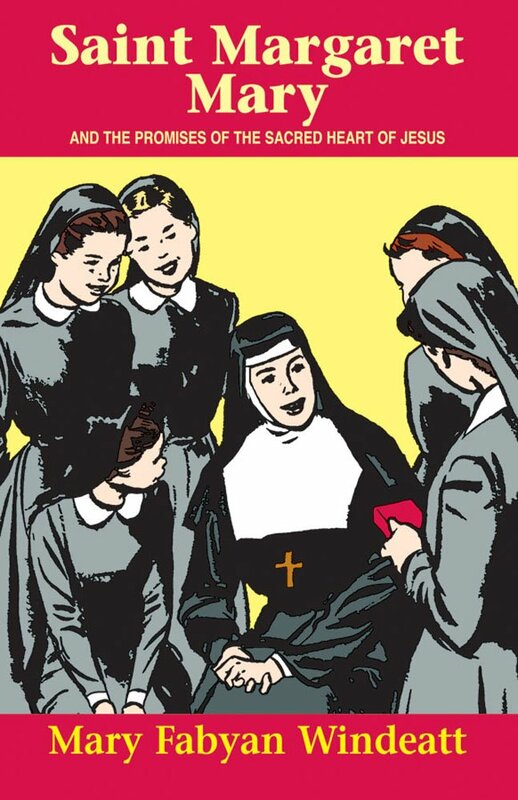 Be sure to read this miraculous Sacred Heart story called Badge of Courage by Christine Trollinger. WOW! 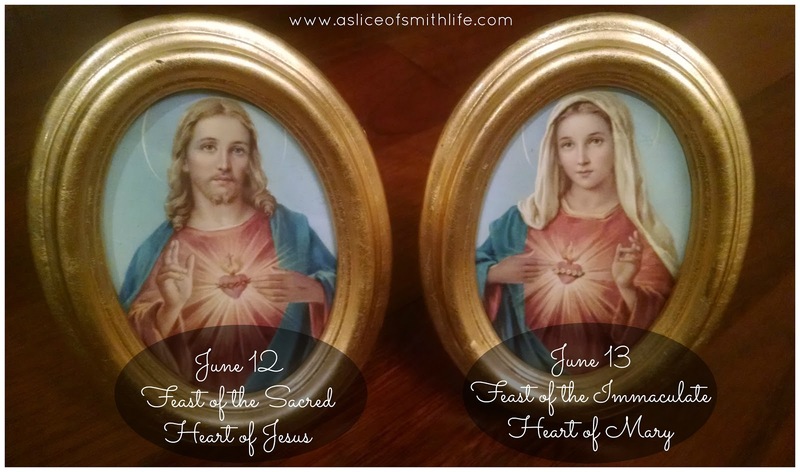 And Jennifer Miller @ Family in Feast and Feria has such great information about the devotion of the Sacred Heart in her post Devotion to the Sacred Heart of Jesus. Go check it out! I learned so much from her post and I think you will too! 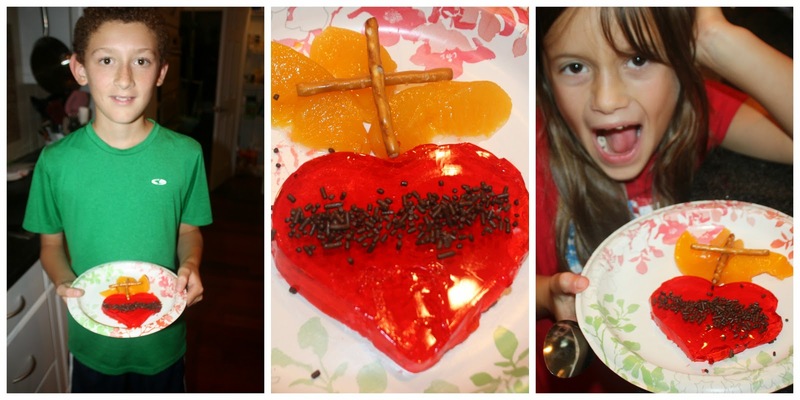 Last year we made this edible Sacred Heart art that was inspired by Jennifer at Catholic Inspired. Thanks Jennifer for the great idea! Here are some pictures I took of what we made. 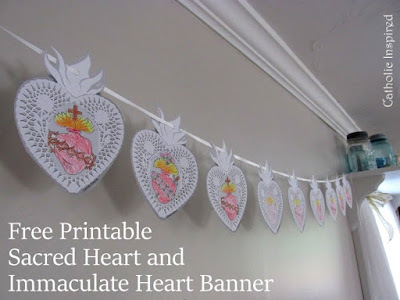 And for another edible way to celebrate the Sacred Heart of Jesus, followed by the Feast of the Immaculate Heart of Mary (which is celebrated on June 13), be sure to check out Tiffany's veggie and fruit heart platters HERE. Beautiful and nutritious too! 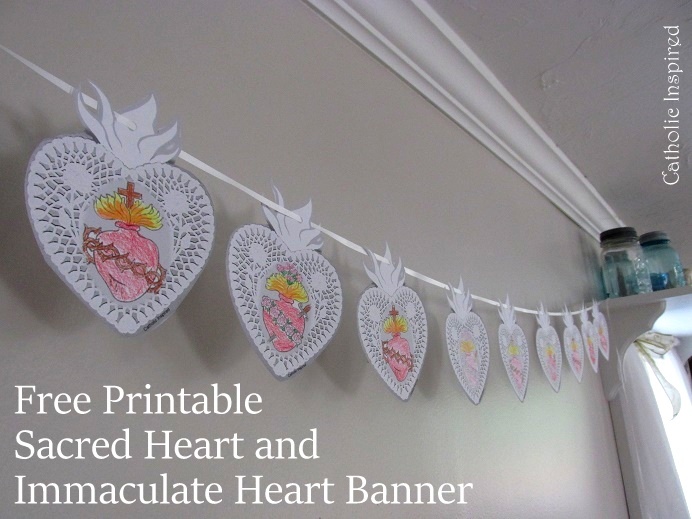 If you are interested in doing an art project to celebrate the Sacred Heart of Jesus and the Immaculate Heart of Mary, be sure to check out Jennifer's great free printables at Catholic Inspired to decorate your home. These look beautiful and easy too! 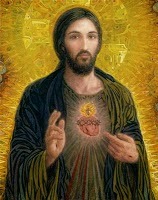 I love this painting of the Sacred Heart of Jesus created by Catholic artist, Cameron Smith. (no relation to me, but he and his wife are the Godparents to our 5th baby) We have both the Sacred Heart of Jesus and Immaculate Heart of Mary prints hanging in our home. You can view and order this print HERE by visiting Cameron's art website. 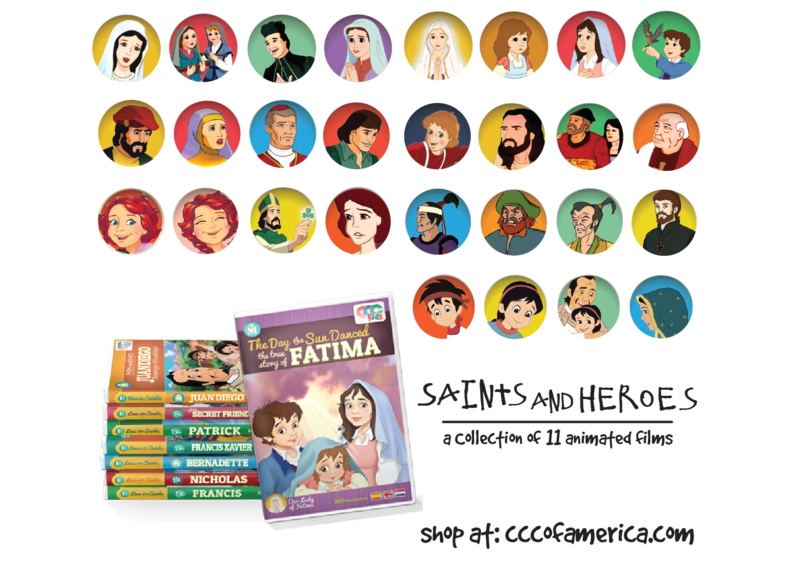 If you are looking for a great children's book for ages 10 and up to read (I have also enjoyed reading it aloud to my kids during the month of June each year) check out this book about the holy French nun who first saw visions of Jesus' Sacred Heart called St. Margaret Mary: And the Promises of the Sacred Heart of Jesus. May you have a blessed June celebrating such special feast days during this liturgical season of Ordinary Time! I'm linking this post up to #WorthRevisit hosted by Theology is a Verb and Reconciled To You. See more #WorthRevisit posts HERE. I love your framed photo of the Sacred Heart of Jesus. 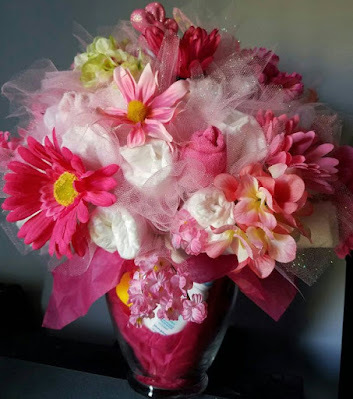 So many fabulous crafts, ways to celebrate this month!! I'm loving all of them! I missed the jello SH at Jennifer's - - amazing. That's a must -do for us too! 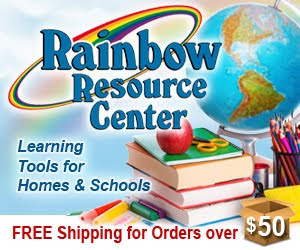 What a great idea and your kids look like they had a blast with it. And learned a lot too of course !! Great pics! Hi Tracy! Thanks so much for sharing all these great ideas, as well as, sharing a few of my posts! 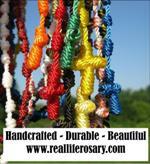 Love the pics of your kids and jello Sacred Hearts! So much fun!! What a lovely post, Tracy! 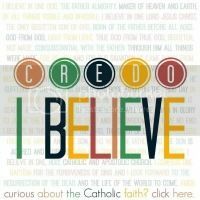 Isn't our Catholic faith so rich and meaningful? I hope we get to meet at Edel! Great revisit!! LOVE the Sacred Heart feast. Thanks for joining us this week! HOPE we can see you linked more often :))) Love your posts!! Thanks Chris! You do such awesome crafts! Thank you Allison! Your Revisit link up is fun to join in on! Thanks!